The staircase at Union Station will get an upgrade as part of $12 million in renovations. Chicago Mayor Rahm Emanuel announced last week that Chicago’s landmark Union Station will be getting some repairs, thanks to $12 million from the station’s owner, Amtrak. Emanuel said the station hasn’t been keeping up with a changing transit system. “Union Station, given it’s the third busiest rail hub, is actually fighting below its weight class,” Emanuel said. The renovations are being called a ‘first step’ toward expanding and modernizing the historic building. There is a Master Plan for the whole structure — $500 million worth — but that’s a long-term project. 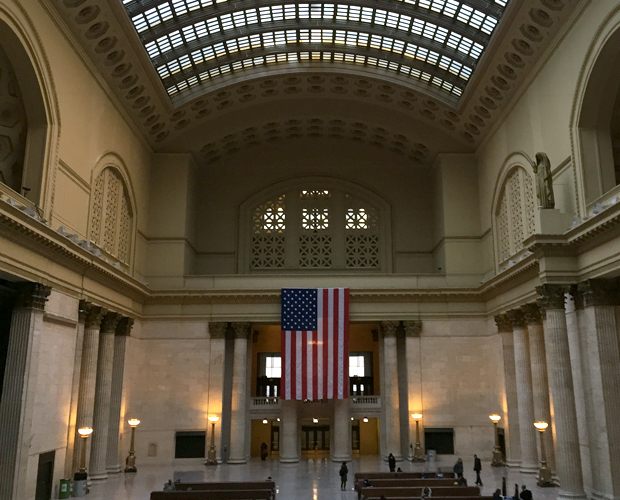 I asked Chicago architecture critic Lee Bey to show me around Union Station. He says beneath the crowded concourse and the dirty platforms that annoy many commuters, Union Station is still a work of art. Especially if you enter through the Great Hall on the east side of the building. Sunlight streams in from huge windows high above us. The area is simple and massive, almost like a museum or an elegant old theater. “What I’m really impressed about in this building… is the volume,” Bey said. “The volume of the interior. And how few spaces there and in the city or any place where you can walk into a space like this… there’s enough foresight by Amtrak and ownership to just let this space be what it needs to be. And that’s beautiful.”Like the Great Hall itself, train travel has a nostalgic sensibility. Places like Union Station were often travelers’ first impression of Chicago as they arrived, or the last thing they saw as they left. We stand under a coffered ceiling, looking up at a marble staircase with gilded handrails. It’s the staircase where the gangster bloodbath from The Untouchables was filmed. It still makes a nice photo, but the stone stairs are worn deeply in the center from nearly a century of travelers’ shoes. Pieces are gouged out. Fixing this staircase is part of the $12 million of repairs, along with the limestone facade out front. The money is also meant for better, more energy-efficient doors and a more spacious passenger waiting area. Amtrak spokesman Marc Magliari says Union Station sees about 300 trains a day, which is the same number that came through in the 1940s and 50s. More than 100,000 people move through Union Station every weekday. The difference is, more than ever before, they’re commuters rather than long distance travelers. Greta Johnsen reports and anchors weekends on WBEZ. Follow her @gretamjohnsen.